“If you work hard, and put your heart and soul into it, then you are allowed to steal some,” said Shivpal Singh Yadav, a minister for public works for India’s most populous state, Uttar Pradesh (UP). “But don’t be a bandit.” Caught on camera, Yadav’s words were replayed in newscasts across India on August 9, 2012, nine days after a power failure left half of India’s population—one-tenth of the planet’s people—without power. Among the Indian states that suffered the blackout, twice, was Yadav’s home state of UP. A preliminary government investigation into the cause of the blackouts blamed “indiscipline of state electricity boards and faulty management by the northern grid operator Power Grid Corporation” for the blackouts. Yet two other simpler reasons, theft and climate change, should not be overlooked. Theft and corruption have played a role in India’s power failures for decades. At every step in the supply chain, money is siphoned off via direct bribes or shortcuts. There is the theft of the politically connected—like Yadav. And there are special deals cut with farmers, large hotels and others who collect favors in the form of free or guaranteed electricity in exchange for bribes of powerful officials. Then there is theft of the Adivasis, or tribals, the untouchables and other disenfranchised people of India. More than a third of India’s households do not have enough electricity to power a light bulb, according to last year’s census. And so they steal it. In fact, as much as 40 percent of India’s electrical power is stolen. June and July is traditionally the season for planting rice in the north. Rice is a staple crop for India, and India’s paddies provide a significant share of rice for export to global markets. Rice paddies require an abundance of water. With a delayed monsoon (yet another anticipated outcome of climate change), farmers in North India were using more power than usual to pump groundwater to irrigate their crops. This, together with the ongoing theft of power from the grid, certainly played a pivotal role in the northern grid’s power failure. How did India, a country with plentiful coal reserves and a growing GDP, get into a situation of energy theft and such energy inequality? World Bank policies had a lot to do with it. 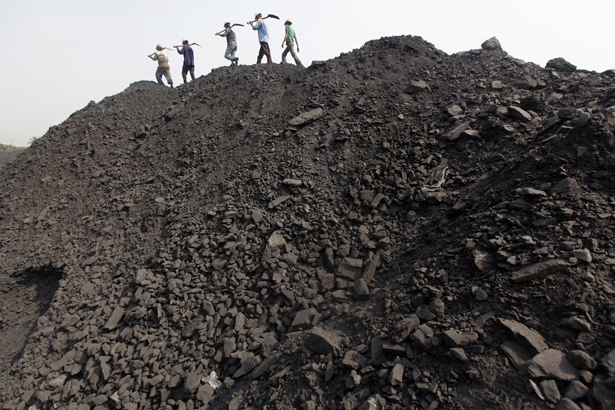 Coal is India’s biggest and dirtiest source of power, providing over 57 percent of the country’s electricity. Yet, despite its abundance, it is increasingly hard to come by. One reason: unsettled land is in short supply in a country about a third the size of the United States but home to almost four times—or 1.2 billion—people. For decades, the World Bank provided inducements to the government of India to expand its exploitation of coal. The bank also pushed privatization of the power sector and expansion of strip mining. Underground miners once had one of India’s most powerful labor unions. While dangerous and dirty, these jobs provided a decent living, and underground mining prevented the widespread environmental and social destruction that open-pit mines ushered in. At the World Bank’s behest, however, strip mines replaced thousands of underground mines; miner’s unions were busted and replaced with a handful of workers driving large dump trucks. Strip mines ravage the landscape and cause acid drainage, which kills fish and makes the water unsafe for drinking or bathing. They smolder in a constant state of combustion. As with large dams, another energy development approach favored by the World Bank (which are also proving unreliable as they fill with silt), thousands of India’s poorest tribal people have been uprooted to make way for strip mines and placed in resettlement camps where prostitution and alcoholism are endemic. India’s coal is heavy in ash content, and population pressures on available land means ash disposal is also a problem. So, often, the polluting ash—with heavy metals and radioactive elements—is merely dumped in the already polluted rivers. Or it is dumped back in the empty mining pits, where it leaches into the aquifers. Though the bank recognized a focus on privatization of the power sector and coal-fired power for the grid would result in power largely being provided for heavy industry and urban areas, where payment rates were highest, they rationalized this approach the same way they rationalized “trickle-down” models of development elsewhere in the world: they assumed that energy services would eventually trickle down to the poor. However, civil society groups, including ours, urged the bank to review this flawed assumption and instead focus on providing renewable energy to the poorest in rural areas. At our urging, former World Bank President James Wolfensohn agreed in 2001 to conduct a thorough review of the Bank’s investments in oil, gas and mining to determine whether or not their loans were helping the poor. Their own hand-picked “eminent person,” Emil Salim, a former board member of one of Indonesia’s largest coal companies, who headed up their three-year Extractive Industries Review, urged them to uphold a moratorium on lending for coal and to get out of oil completely by 2008. The poor were “worse off,” not better, Salim determined, as a result of the World Bank investments in coal and oil. Nevertheless, the Bank ignored his advice and continued to provide billions to one of the most polluting of fossil fuels, while ignoring its climate impact. The World Bank once claimed it would provide an acre of land for every acre taken from those who got out of the way for the mines and dams they financed. But that promise was long ago watered down, then forgotten. The regions of India where coal is most abundant—including the newly formed state of Jharkhand, which means “Land of the Forests”—also happen to be the most densely tribal, where trees and other natural beings are viewed as sacred. And this is where resistance is the strongest. With a tribal government, Jharkhand has kept twenty-three proposed thermal plants and about twenty-two coal-mining companies from entering tribal villages and going online since 2005. A primary rationale India and the World Bank gave for burning India’s coal was “energy independence.” Yet two decades after the World Bank opened up India’s mines for rapid exploitation, as India runs into roadblocks and runs out of space for open-pit mines and ash disposal, it is increasingly turning to coal from abroad—which comes with lower ash content but at a higher price, from places such as Indonesia, Australia and even Appalachia. And because of problems with coal and large dams, the government of India is increasingly trying to force nuclear power on the agenda. Yet, here, too there are obstacles: In the aftermath of the Fukushima meltdowns, in Kanyakumari Kundakulam, more than a thousand women have been protesting a nuclear power plant proposed for that rich agricultural area with regular hunger strikes. Ironically, one region that did well during the recent power crisis in India was Jodhpur, where, after a brief interruption, the windmills kept hospitals and households powered up while half of the country went black. Had the bank heeded its own studies in the early 1990s, which showed that a more economically efficient way of handling the energy needs of the poorest in rural areas would have been to invest in renewable energy, many of India’s energy and environmental problems would have been solved. And had the World Bank focused on its mandate—providing energy for the poorest, rather than rich urban areas, and businesses—India might have ramped up its use of renewable energy to a level comparable to Germany’s, which, with far less insolation, recently derived 40 percent of its electricity from solar power. Instead, the bank foisted on the largest democracy in the world a neoliberal trickle-down model—where unions were busted, wealthy corporations like Tata were given development assistance to build coal mega-burners, people were treated like pawns on a giant chess board, while they targeted the affluent and heavy industries first for energy delivery using some of the most environmentally destructive energy resources on the planet. Nearly two decades later, after billions in investment, one-tenth of the world sits in the dark, the planet is rapidly heating up, electricity theft consumes as much as 40 percent of India’s power, and the only thing trickling down to the poor is contaminated water or, if they’re lucky, enough water to keep their parched crops alive. Daphne WyshamDaphne Wysham directs the climate and energy program of the Center for Sustainable Economy and is an associate fellow of the Institute for Policy Studies.